This one pan gluten free meal combines beef and vegetables with cheese under a cornbread crust. Full Disclosure: I've never eaten real authentic tamale pie before, though I have eaten real tamales* and assisted in the Big Production that goes into making them. 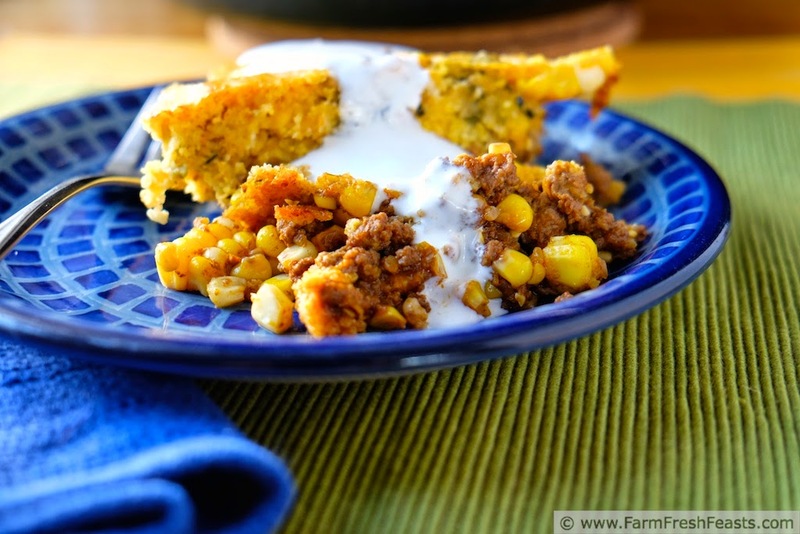 I confess I first got the recipe for tamale pie off the bag of a bag of cornbread mix. It called for cans of chili, shredded cheese, and packages of cornbread mix. I fixed it while my spouse and I were still in the first throes of living as man and wife [we'd been married for a while, but it took us a long time to actually live in the same country] and it was fast, easy, and tasty. This recipe is not quite as fast as emptying a few cans into a skillet, but it's close. After I got more adventurous in cooking, I started making tamale pie using my own meat mixture, and then later using my own cornbread. Ever since we joined a Community Supported Agriculture (CSA) farm share, I'm constantly looking for ways to add additional vegetables into familiar dishes. You can never have too many vegetables (unless your farm share pick up is the day after tomorrow and you've still got two crispers full of beets and kale veggies). Last summer, before Butch came into my freezer, I managed to combine chiles from New Mexico, beef from Michigan, and corn from Delaware along with patty pan squash and red onions from Ohio into a tamale pie. We'd returned from a beach vacation in time to walk down the street to the local grocery store and grab a couple of quarts of freshly roasted Hatch chiles. I couldn't wait to get started on salsa verde (my usual use for Hatch chiles) so I chopped up chiles and used them in both the filling and the topping for this dish. 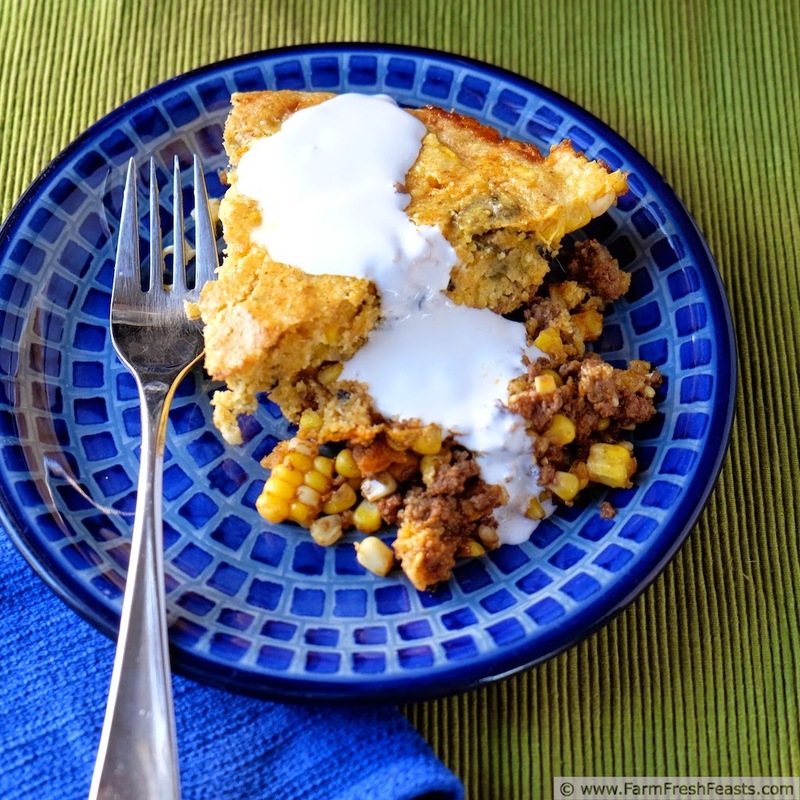 The kids and I enjoyed the tamale pie so much I put it into the rotation, not that I have much of a rotation what with trying new things all the time, but still. It was a keeper. This is a tasty way to add some summer veggies + ground beef into a one pot meal. Lately you may have noticed that I've been using lots of Hatch chiles from New Mexico, which 'tis true are not local to me here in Ohio. Aside from the fact that these chiles taste good--and I don't have to do the roasting--New Mexico has a soft spot in my heart. I've been to New Mexico on vacation, twice, and got married there each time. I married the same guy [we forgot to take photos the first time, or invite our folks, so a re-do was appropriate]. It's not a bad state to get married in--you just needed $25 cash and a photo ID, the minimum age was 13 years old, and my marriage was recognized by the rest of the country. What's not to like? And, as a bonus, they grow tasty chiles there--though as far as I know I've never eaten a Hatch chile in New Mexico. Perhaps if we get hitched again . . . though my spouse would not appreciate a 3rd anniversary to remember. For more recipes using Hatch chiles, please see my Hatch Chile Recipe Collection, part of the Visual Recipe Index by Ingredient. For even more ideas using all kinds of peppers, from mild bell to spicy chiles, check out my friend Kristy's site JalapeñoMania. On my FB page I'm sharing recipes from other bloggers, and I'm pinning good stuff all over my Pinterest boards. Wanna know how to use this blog? Click here. Preheat a 10 inch ovenproof skillet over medium heat, and the oven at 400 degrees Fahrenheit. Brown the ground beef, and season it taco style with the taco seasoning of your choice. 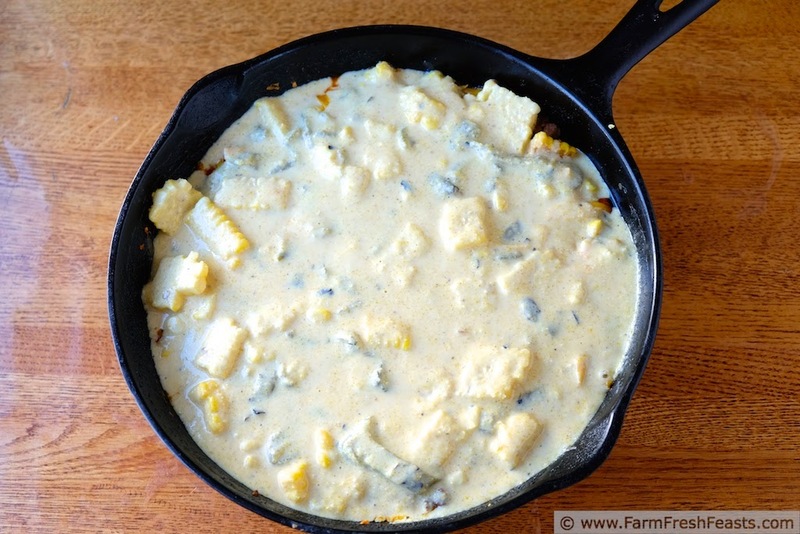 Cut the kernels off the corn and add the kernels from 2 of them to the skillet, stirring to combine. In a large bowl, beat egg and buttermilk together. Add cornmeal, baking soda, and salt and beat well. Stir in the remaining corn kernels and chopped chiles. 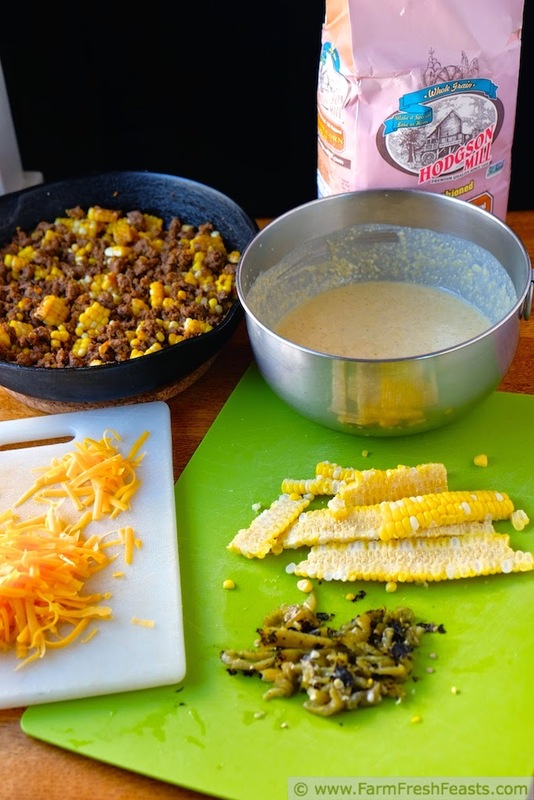 Spread cheese over the beef and corn mixture in the skillet. Pour cornbread batter over the cheese, and bake for 30 minutes until top is browned and cornbread is cooked through. Serve, especially good with some crema poured over top. *My adorable spouse recently learned that you're not supposed to eat the corn husk when eating tamales. He commented that it probably tastes a lot better when you're not trying to chew a mouthful of husk. Love that young man enough I'd marry him a 3rd time. I've never made tamales myself, and love the idea of getting the same flavors with a lot less effort. What a great recipe idea! Less effort, great flavor--always a winning combination. I need to make this. This photo just made me have a major preggo craving! Those preggo cravings are so intense! I think I have a better shot at going on a honeymoon than a 3rd wedding! This looks incredibly delicious! Thanks for linking up with What's Cookin' Wednesday! I saw the name of your recipe and could barely contain myself! I love Hatch chiles!! Can't wait to try this! I did not get what the fuss was about Hatch chiles until I tried them. At first it was for the convenience factor of having the grocery store fire up their chile roaster in the parking lot, but I got quickly hooked on the taste. 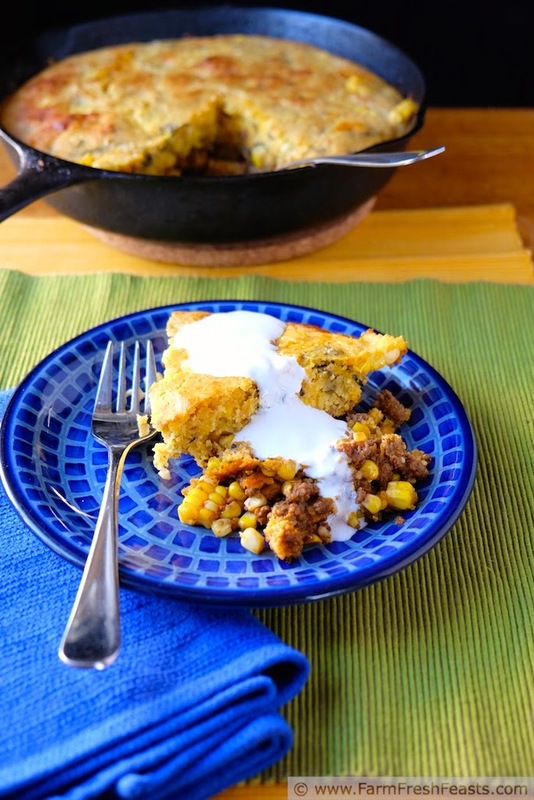 This is a great story of how a recipe morphed and an even better story of how a marriage begins in the real world:) Love the tamale pie, too. 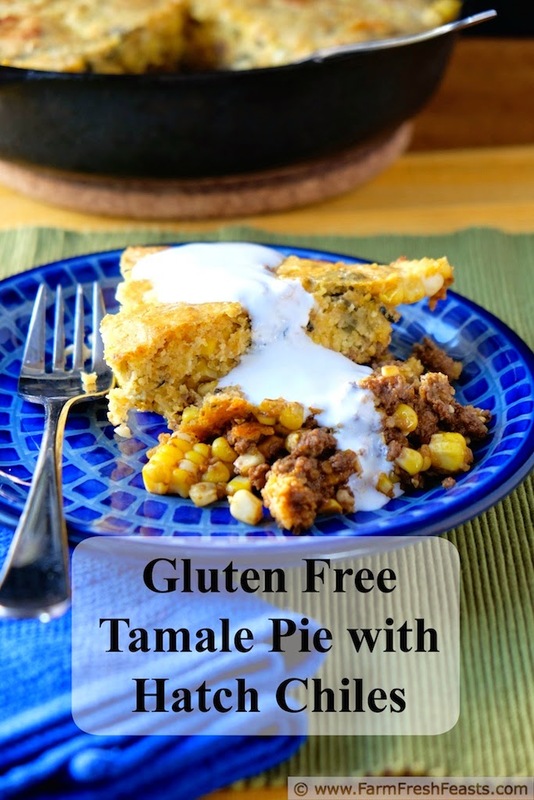 Having never eaten anything claiming to be authentic tamale pie, I'll just go with this one. Laura,Yep, just go with this one. It's a sound plan.